Weighted 1.5 lbs. per ft.
1/2in. 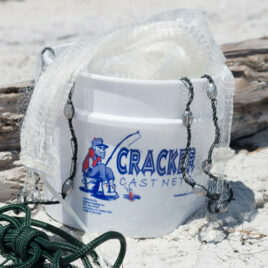 Mesh – Great for medium baits 4” or longer in deeper water 10ft. -15ft.. Fast sink rate. 5/8in. Mesh – Great for larger baits in deep water. Flatter, Faster, Farther. That's what you'll get with our castnets. The vision of two determined fisherman, Calusa Trading Company produces quality castnets that meet the demands of professional fisherman. They lay flatter, sink faster, and throw farther with an ease unrivaled.